I LOVE YOU ALL FOR BEING ON THIS PAGE AND DONATING!! As always, I am knocking myself silly to try to eradicate pediatric cancer. This year, I'm going to do three events -- the NYC Half Marathon, the NYC Triathlon, and as the coup de grace, the 70.3 Half Ironman in Rio! 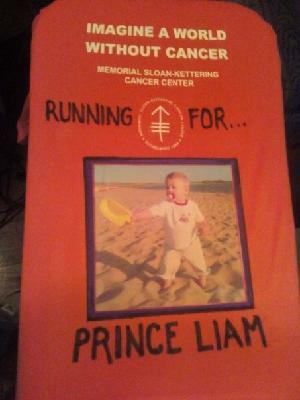 This is, as it always is and will be, in honor and memory of Prince Liam, who battled stage 4 neuroblastoma at MSKCC for two-thirds of his short life, and did it with a smile on his face and a love for life that has inspired thousands of people to join the fight against cancer. The only thing standing between us and a cure is money and time. None of us can do much about the time aspect, but we can do something about the money.